A student from Dearne Valley College in Rotherham has been selected from thousands of nominations to win a prestigious award at the National BTEC Awards in London. With its main campus in Manvers, Dearne Valley College specialises in vocational training and apprenticeships. 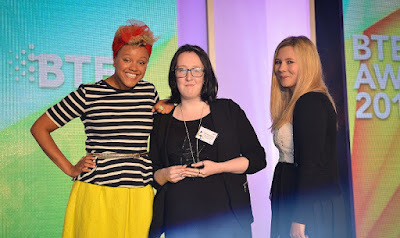 Bethany Pritchard, who is currently on a Level 3 Health & Social Care course, attended a reception at the House of Commons along with her college tutor and other guests, before being presented with her award at a glitzy, Hollywood-themed ceremony hosted by Radio 1 Presenter Gemma Cairney at the Royal Horticultural Halls. Now in their sixth year, the BTEC Awards 2016 celebrate vocational excellence an are hosted by Pearson, the awarding body that owns BTEC qualifications. They recognise student success from each sector and featured a video message from Dragon's Den favourite, Peter Jones, performances from fellow BTEC students and inspirational speeches from award-winning entrepreneur, Zoe Jackson MBE and British adventurer, Ash Dykes. Bethany was nominated after overcoming a number of barriers in her personal life and displayed determination to succeed, leading to fantastic results and securing herself a coveted place on the Rotherham NHS Foundation Trust Cadetship programme. Alongside her studies, she has also dedicated much of her time since the age of 14 to volunteering for a local Dementia charity, who work closely with the NHS, caring for patients diagnosed with dementia under the age of 65 and their carers. She facilitates social gatherings, organises fundraising events and also promotes the work of the charity in the wider community to raise awareness. Bethany now plans to pursue her ambitions of studying Mental Health Nursing at University whilst also establishing an independent charity with her father. They are in the early stages of developing an independent charity to facilitate social gatherings in the community for people diagnosed with dementia. They hope to offer people an outlet to acquire social and physical stimulation, appropriate to their level of need and invaluable respite time and peer support for carers. Bethany (pictured, centre), said: "My journey on the BTEC course to date has given me a fantastic insight into my future career as a mental health professional. I'm a firm believer in hard work and striving to achieve to the best of my ability, and to be recognised for this on a national level is a huge honour for me; I will treasure it!"